It's a bizarre experience to arrive on the scene of a disaster. All routines, patterns, and assumptions are discarded and replaced by a new reality. Anyone who has watched helplessly as a house burns to the ground or as a building is demolished by high winds knows how this feels. I had a similar circumstance, though on a smaller scale, this past Saturday when I walked into the lower level at church. 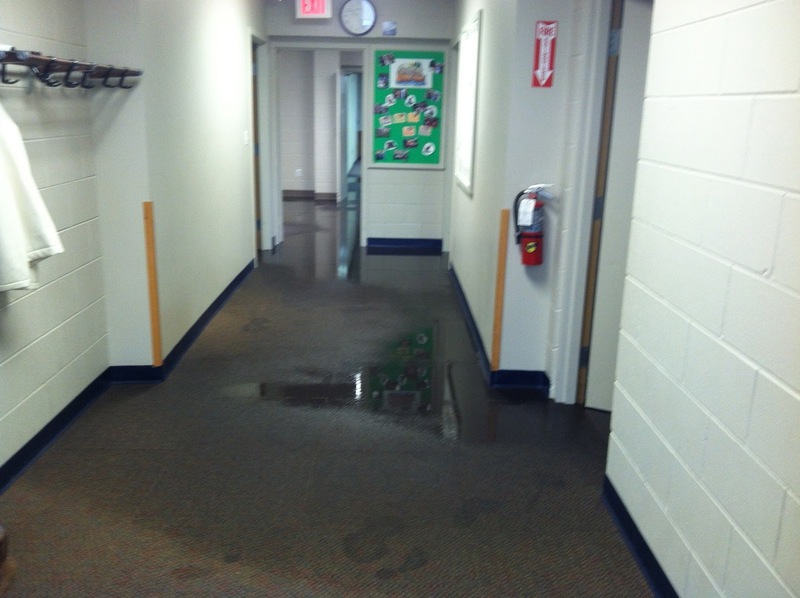 "Is that water in the hallway?" my daughter asked. It was indeed. 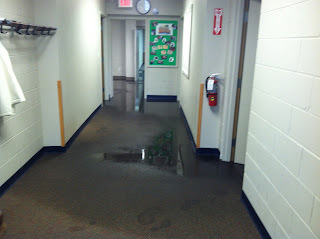 A lot of water. 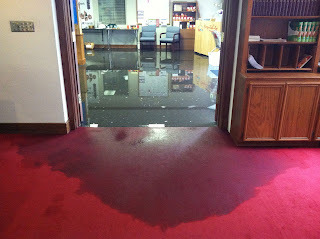 Several thousand gallons of water had poured out of a broken water line on the third story and was spreading throughout the church. 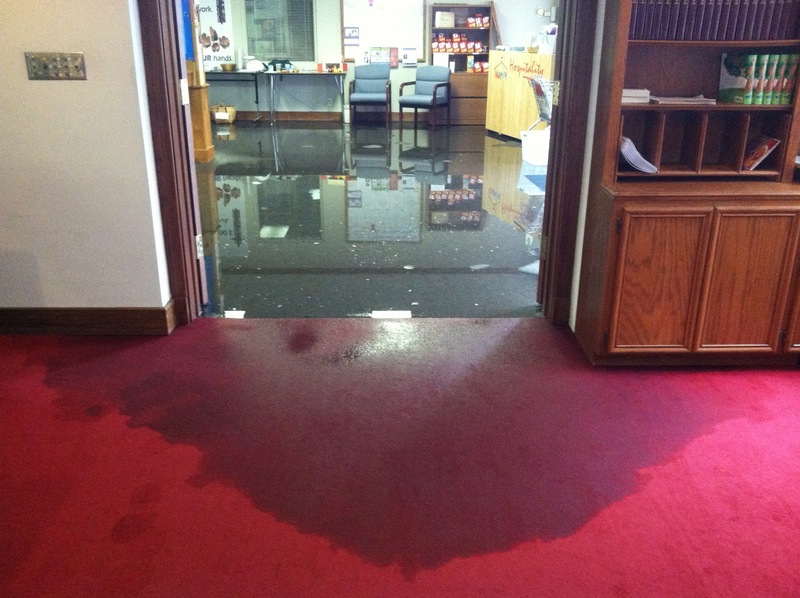 All three levels experienced water damage, including carpeting, ceiling tiles, and walls. Affected rooms included the narthex, fellowship hall, classrooms, and Sanctuary. It was a mess. 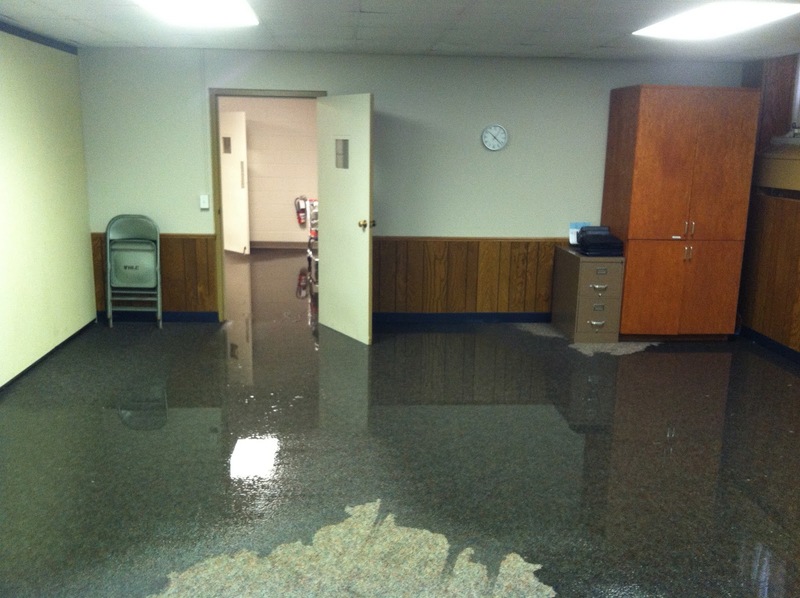 After turning off the water, I made a few phone calls to the pastor and property committee members. 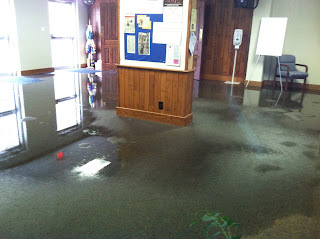 Mitigation professionals came to remove the water and discard soiled carpet...but there was still a lot of work that needed to be done in order to "prepare the way" for Palm Sunday. Items needed to be sorted and either disposed of or moved to a dry location. Equipment and furniture had to be relocated. Temporary flooring needed to be put in place. A few more phone calls yielded additional people. Kiersten (age 5) said it best, when she told her older brother, "We need to go help. If our house had flooded our church friends would be here to help us!" People of all ages worked throughout the afternoon and late into the night and made it possible for worship to happen the following day. It was a day that was both heartbreaking and redeeming. As people responded with patience and generosity throughout the weekend, I was reminded of the myriad ways God's Spirit works through people to make the best of a bad situation. A shoe maker asked Martin Luther how to best serve God. Luther asked him "What is your work now?" The man replied "I am a shoemaker." Luther told him "Make a good shoe and sell it at a fair price." It's a lovely story which conveys the notion that people serve the Lord when they use their God-given gifts in ways that are good and honest. In this way, vocation is the pairing of a person's abilities and interests with the needs of the community. ...you need to find the one interest or activity that truly fulfills you in ways nothing else can. Then, really immerse yourself in it for a few fleeting moments after an exhausting 10-hour day at a desk job and an excruciating 65-minute commute home. During nights when all you really want to do is lie down and shut your eyes for a few precious hours before you have to drag yourself out of bed for work the next morning, or on weekends when your friends want to hang out and you’re dying to just lie on your couch and watch TV because you’re too fatigued to even think straight—these are the times when you need to do what you enjoy most in life. Vocātiō seems like a simple concept - serve God by doing what you love. Yet all around I feel the anguish of people who find this to be unattainable. There's the teenager who feels compelled to get good grades so he can go to a good college so he can get a job that pays well enough for him to service the six-figure college debt he will rack up. There's the college student who changed her major because there wasn't enough job security in what she was passionate about. And there's the young GenXer who can neither imagine working for the same company another year (let alone 30) nor imagine taking the risk of changing careers. Certainly there are many examples of people who have stepped out in faith to serve God and humankind through their vocation. There are also people who haven't made a monumental change in their profession, but have modified the way they approach the work they are currently doing. I wonder how the church - it's people and it's institutional structures - can better encourage God's people to see their work as prayer each day. Have you witnessed people in your life who live out their vocation? How might you serve God through your "ordinary" job?